Braided Waters sheds new light on the relationship between environment and society by charting the history of Hawaii’s Molokai island over a thousand-year period of repeated settlement. From the arrival of the first Polynesians to contact with eighteenth-century European explorers and traders to our present era, this study shows how the control of resources—especially water—in a fragile, highly variable environment has had profound effects on the history of Hawaii. 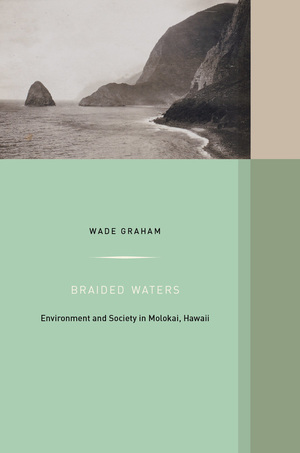 Wade Graham examines the ways environmental variation repeatedly shapes human social and economic structures and how, in turn, man-made environmental degradation influences and reshapes societies. A key finding of this study is how deep structures of place interact with distinct cultural patterns across different societies to produce similar social and environmental outcomes, in both the Polynesian and modern eras—a case of historical isomorphism with profound implications for global environmental history. Wade Graham is the author of Dream Cities: Seven Urban Ideas That Shape the World and American Eden, a cultural history of gardens in America. He teaches urban and environmental policy at Pepperdine University's School of Public Policy.